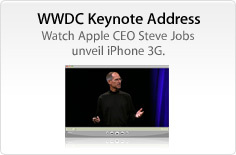 Apple posted the WWDC 2008 Keynote Address by Steve Jobs on their website. You can watch it streaming in either normal or HD quality through this page. Apple also posted the Keynote Address as a downloadable podcast through iTunes. Click here if you have iTunes installed.